Dr Shakeel Afridi, who helped the United States via a fake polio campaign to reach Al Qaeda chief Osama bin Ladin, has unwittingly put thousands of children in the tribal areas of Pakistan at the risk of the polio virus. After the disclosure that Shakeel was involved to locate bin Laden, the Pakistani Taliban and other militant organisations banned polio campaigns in their respective areas. During the recent polio campaign from July 16 to 18, around 34 million children would have been vaccinated, but terrorist leaders from North and South Waziristan have put a ban on the drive. According to a report, at least 160,000 children in North Waziristan and 80,000 in South Waziristan remain deprived of polio vaccines. Furthermore, more children remain deprived of vaccinations in Khyber and Orakzai agencies because of the deteriorated law and order situation. Pakistan remains one of the few countries where the polio virus still exists. In 2010, the country had 144 polio cases and 198 in 2011. Twenty-two cases have been detected this year so far. Tribal areas, that have recorded 50 per cent of the country's 22 polio cases in 2012, had been declared by the World Health Organisation a potential threat to countries declared polio-free. 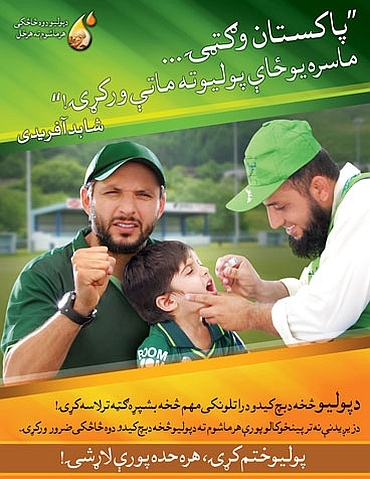 To counter this, the United Nations has selected cricketing superstar Shahid Afridi as their 'polio champion' to promote polio vaccination. "Every child is a gift of Allah and every child in Pakistan to me is like my own child, so I will do my best to take the message to every doorstep in Pakistan. Reaching every child, every time with the polio vaccine is not only necessary, but it is our duty. This disease can't deter us, we will defeat it," Shahid Afridi vowed. Afridi himself himself is a Pashtun from Khyber Agency. Earlier, the Taliban in North and South Waziristan banned polio vaccinations, demanding a complete halt to American drone strikes in the tribal areas. Hafiz Gul Bahadar, the head of all Taliban factions in North Waziristan was the first to issue an anti-polio statement. The pamphlet read, "What is the need for such a polio campaign over which the 'well-wishers' are spending millions of money, as hardly a child among the thousands of children becomes victim to polio virus. While at the same time, the well-wishers (US) with the help of its 'slave' Pakistan are busy in targetting (us) with the drones. Hundreds of our innocent children, women and old men have become prey to such attacks," it says. The pamphlet further said, "There also strong chances of using the polio campaign as a tool of spying against the militants; Shakeel Afridi is leading example in this regard. So from today we announce a complete ban over polio in North Waziristan; there would be no reason for the violators to complain about the treatment he receives (from Taliban)." Following North Waziristan, Wana based militant commander Mullah Nazir in South Waziristan also issued the same order. "Polio and other foreign-funded vaccination drives in Wana sub division would not be allowed until US drone operations in the agency are stopped. The pamphlet calling Dr Shakeel Afridi as traitor said, "Traitor Dr Shakeel Afridi's fake campaign in Abbottabad is a proof that infidel forces are using media, education and development as a tool to gag Muslims." Apart from Waziristan, children from Khyber Agency and Orakzai agencies are also at the risk of polio. Not only some military activities against the Taliban are underway there but these areas are also under the strong influence of Taliban. According to a report, the target was to vaccinate 200,163 children, but the campaign was halted in parts of Bara and the Tirah valley, and 111,556 children still remain at risk. Khyber Agency has more polio cases more than any other part of the country -- nine cases have been reported there this year.